GRT Yamaha Official WorldSSP Team’s Lucas Mahias secured his fourth front row start of the season on Saturday at Portimao, round nine of the 2017 FIM Supersport World Championship. The championship leader qualified in second in a tight session that saw less than half a second separate the top six riders. His teammate Federico Caricasulo will start Sunday’s race from the front of the third row in seventh, with both riders confident of their ability to fight at the front on Sunday. 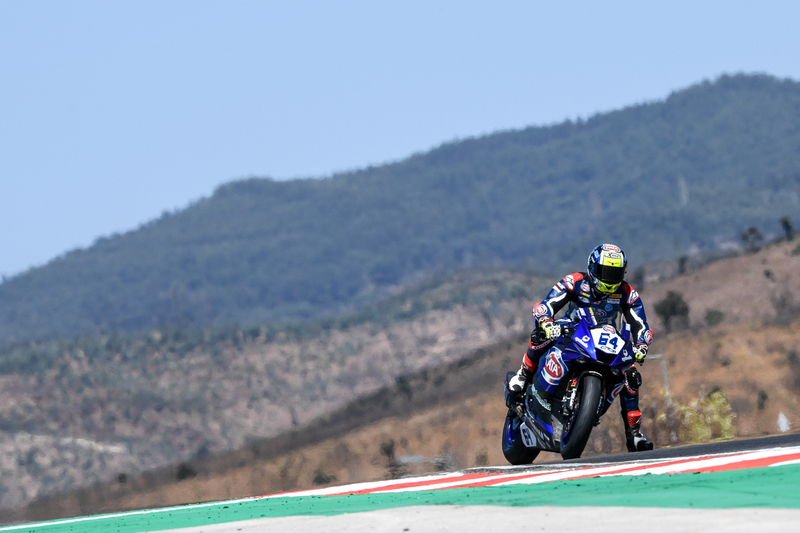 Mahias has been struggling to find a good feeling with his Yamaha R6 around the 4.592km Autódromo Internacional do Algarve this weekend but worked extremely hard with his team on Friday night and Saturday morning to make some setup changes for SP2. The 28-year-old French rider clearly made a breakthrough and he managed to improve his best time from practice by over half a second to set a 1:45.576, which was good enough to secure second on the grid. Mahias leads the championship by one point from Kenan Sofuoglu – who will start from pole – and after just 0.35s separated the two in SP2, he is relishing the chance to battle with his rival during Sunday’s race. Caricasulo had spent the whole of practice using the harder SC1 rear tyre and focusing on race pace. For SP2 he made the switch to the softer option SC0 rear tyre but found that it didn’t give him the improvements he was looking for. Despite this, the 21-year-old Italian still managed to set a 1:46.365 to finish just 0.835s behind the pole sitter and secure seventh on the grid. Starting from the head of the third row, Caricasulo is confident that with his impressive race pace he can battle with the leading riders in Sunday’s race. There will be four Yamaha R6s on the front three rows on Sunday as Kallio Racing’s Sheridan Morais secured fourth on the grid, despite a crash in SP2, and his teammate Niki Tuuli will join him on the second row in sixth. The GRT Yamaha Official WorldSSP Team are back in action on Sunday at 9am local time for Warm Up in Portimao, with the 18-lap race due to start at midday. Check out the results from SP2.